This post is usually saved for older and much more gimmicky products. But I recently came across a box of this stuff and quickly remembered the heat Upper Deck took for it. In August of 2009, Major League Baseball announced that it had entered into a multi-year exclusive deal with Topps to produce officially licensed MLB trading cards. Upper Deck was allowed to continue to make baseball cards in its deal with the MLBPA, but none of their cards would be allowed to use team names and/or logos. 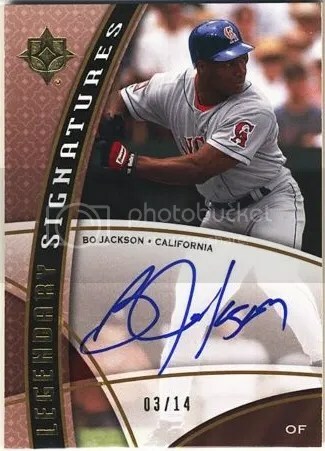 When Upper Deck released 2009 Signature Stars, 2009 Ultimate Collection, and 2010 Upper Deck Series 1, collectors started to notice that not much had changed. Visible logos could clearly be seen all over the place. It didn’t take Major League Baseball long to see this and they filed a lawsuit against Upper Deck for trademark infringement. About a month later a settlement had been reached. Upper Deck was allowed to sell those three products out on the market already, but anything else they made could not contain MLB team names and/or logos. 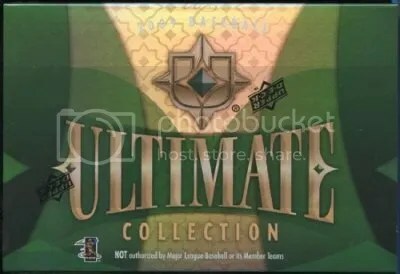 2009 Ultimate Collection Baseball is a fun product to break, if you can find a box. They aren’t the easiest things to locate. Every box contains one “hit”. This product is known for its crazy jumbo patches and on-card autographs.